When you purchase four credits for $8o, you'll receive a full year of USPS NCOA updates. We don't believe in charging according to traditional pricing models, which often require a high minimum number of records and include additional fees to export your data. Instead, TrueNCOA provides the same exact service as any other provider at a fraction of the cost. Upload your file now and see how much you can save - for free! 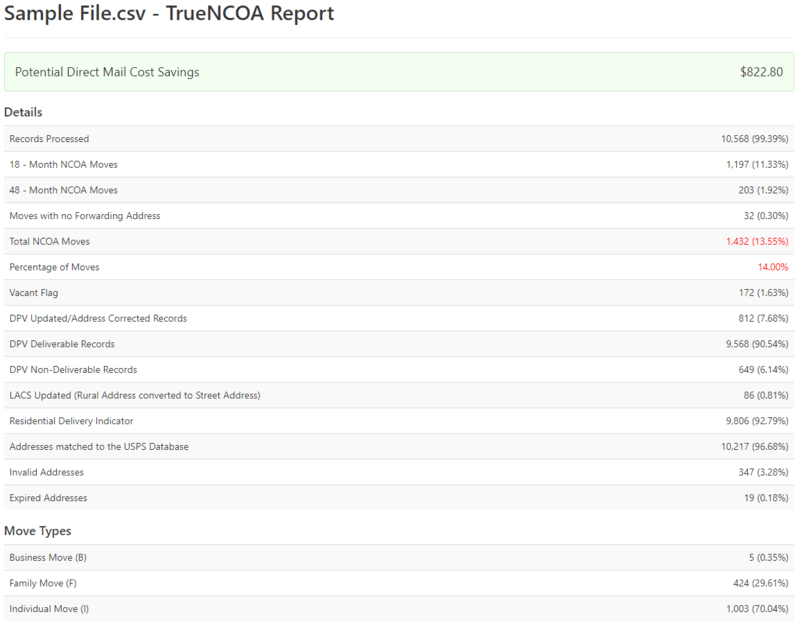 Upload, Paste, or Drag & Drop your data file today for our all-inclusive NCOA services and receive your complimentary TrueNCOA Report - no credit card required. Our customers save an average of $400 on postage and returned mail. Getting started is easy. Register for a free account, upload/process your file, and instantly view our complimentary TrueNCOA report. If you would like to make a purchase after reviewing the total number of moves and estimated savings, your file is available for immediate download.